The Merton Rule: Headline Responses. V. powerful – not so much about chance actually – I think what stands out compellingly is the power of informal contacts, networks and friendships and the extensive use of them. It is useful to have time to reflect on the process of change – the ‘art and the science’ of it. I liked the sense of story direction and drama - I liked reading it, but somehow didn’t quite feel satisfied. I suppose because it’s a real-life piecemeal messy kind of story. You can read a more detailed summary of readers' comments here. You can also read about the questions readers had as well as how readers found it relevant to their own experiences. The Merton Learning History can be downloaded from the Lowcarbonworks project website here. Readers felt engaged by the narrative presented. They recorded that they were excited, inspired and intrigued. The History documented a process of change that readers could relate to – even if the area of policy wasn’t familiar to all of them. One reader wrote: I am encouraged by how a group of individuals challenged the status quo and how they passed on the “buzz” strength and courage to others . One commented on how it was the ‘threat of embarrassment for the key decision maker’ seemed a more powerful motivator than any promise of glory. As an example of change, readers were left wanting to know more about the nitty-gritty processes that lay behind it: How did they see the opportunities and the places to push and the routes forward? How come they were allowed to go round drumming up support? Are we to be dependent on rare individuals with particular skills sets facing particular opportunity structures? How can new opportunity structures be facilitated/promoted? Can the skills that Adrian/others showed be taught? Read more about how readers relate the History to their own experiences here. 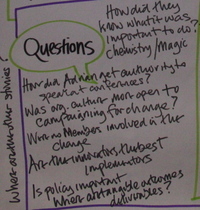 The role of policy as a vehicle for change was of interest. A reader noted that though a champion might create culture change, here that change is being mediated by the rules/policy also being change. Another reader commented that they might not have the patience to go the policy route for change asking “Why is it so slow and complicated!”. The Merton rule is elegant and simple – an idea that can replicate. What was more important: the idea of the Merton Rule itself and the campaign that propagated it. Where did the idea come from? What stimulated it? There was frustration and puzzlement too with the narrative. Readers wanted to hear more from the characters involved or felt that some parts didn’t ring true to their experiences (‘it felt de-politicised’, or ‘was the environment at Merton really supportive?’). You can read more about these questions here. The role of chance as presented in the history was discussed by all readers and contested by one. Though it gives it “light and levity” as a story, “chaos and coincidence are given undue attention”. The reader went on to write: “I think what stands out compellingly is the power of informal contacts, networks and friendships and the extensive use of them”. Another reader agreed but saw also the importance of working with chaos: “I saw the importance of informal networks and of holding on to a vision or purpose but allowing it to flex”. Read some more about Luck and Chance as a general theme in this research. It's useful to have time to reflect on the process of change – the ‘art and the science’ of it. It’s good to allow both elements their rightful place in the whole story. The importance of working with ‘human nature’ in meeting the challenge of sustainability through this method is very interesting & holds potential. Return to the headline responses to the Merton Rule Learning History. 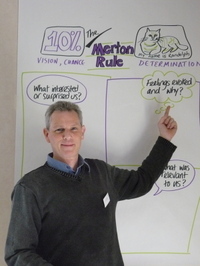 The commitment and enthusiasm to take every possible route in the Merton Learning History (which can be downloaded from our project website here) reminded one active reader of their own experience of working “as an isolated individual” in Local Authorities “charged with progressing sustainability” . Another reader was reminded of the efforts at their council to push through Merton-type rules and noted how central government is making this more difficult now. Another participant who was less familiar with the policy side found that the Merton Learning History had resonances with a community project in which she’d been involved. She liked how that way of doing things was validated by the history. The importance of networks and external campaigning came out as a key learning and action point for readers. One participant noted as an action for themselves to: “pursue a campaigning approach!”; another noted the need to “build and maintain networks”. Return to the summary of readers' comments. 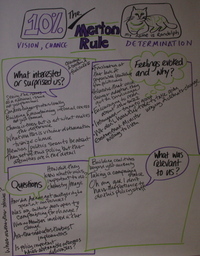 The Merton Rule Learning History has more 3rd party perspectives included than other Histories. However readers nonetheless were left wanting to know more from the characters involved: “I want a richer, more detailed story", wrote one reader, "It’d be interesting to hear more from Nick & Eddy and those early adopters as well as the senior officers" . Readers wanted also to hear more from Adrian himself: e.g What did Adrian say at the conferences – what story did he tell? How come he was allowed to go around drumming up support. And the story itself caused some readers to question. Readers wondered what might ‘lie’ behind some of the descriptions: Was the “supportive” internal environment subjective? Was there really much excitement internally or was it more around the plan (the UDP) itself? Externally, the Central – Local Government relationship as depicted in the history was interesting though one reader felt that the lack of involvement of politicians in the story “didn’t ring true”. Read more here about the research dilemma of having just one or two perspectives on each case.